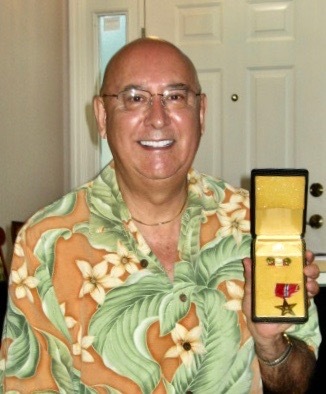 Robert Ruybal of North Port was a member of the 101st Airborne Division who saw action in Vietnam in 1968. Photo provided. 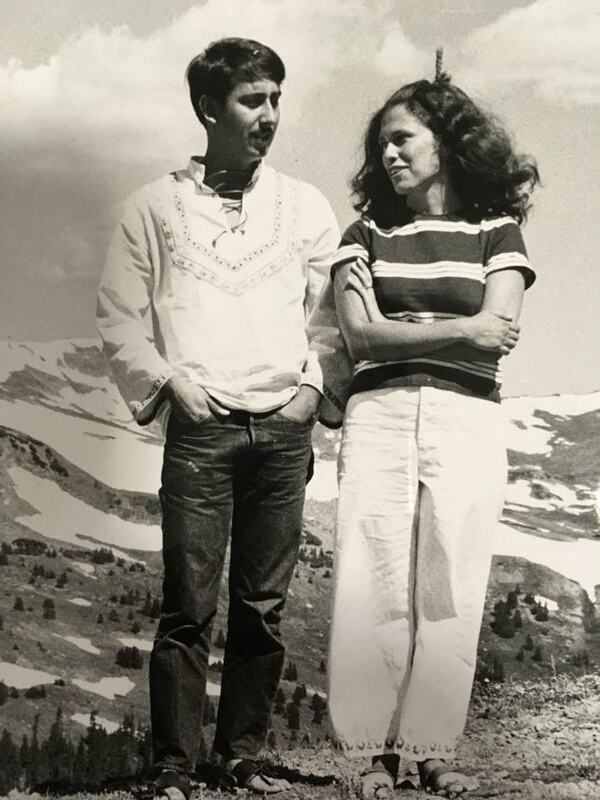 Robert Ruybal of North Port was finishing up his senior year at the University of Colorado in 1968 when he bombed the last semester. “I dropped out of college on Jan. 1, 1968 and soon after, I got a greeting letter from President Lyndon Johnson. I was drafted,” he explained 50 years later. “I took my first airplane ride from Denver to Fort Bliss, Texas where I went to basic training. Sgt. Blue, a sharp looking drill sergeant, taught us how to soldier. When I first joined the Army they told me if I took an extra year I could choose my position in the service, my MOS. I decided to take administration. I figured that beat carrying a rifle. “So I went to typing school. I was the platoon leader during typing school. Then I went to leadership school at Fort Benjamin Harrison,” Ruybal said. “I had been in the Army exactly a year when I received orders to go to Vietnam. “I went to Oakland, Calif. and there I got on a plane and flew to Vietnam. I was assigned to the 101st Airborne Division in Long Binh. I was a clerk typist in the division’s headquarters company. My job for the year was to type orders for overseas reassignment. I would send guys back home to the U.S. or reassign them somewhere else. We also typed KIA, MIA, and WIA letters home to their families. “I moved to Biên Hòa with the 101st. The whole six months I was there we were rocketed by the NVA (North Vietnamese Army) every night,” Ruybal recalled. “The enemy was trying to mortar the runway at our base so our jets couldn’t take off. 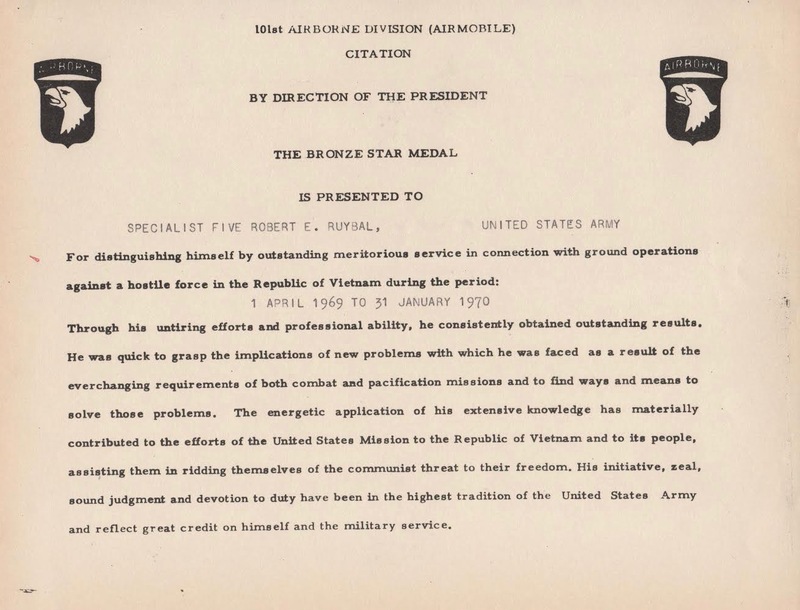 “Our base camp at Biên Hòa was surrounded by a perimeter fence guarded day and night. Every three days we’d pull guard duty. “The NVA two-man mortar teams would sneak in at night and try and get as close to the fence as possible. They would always fire three mortar rounds at the runway and then try to escape the area,” Ruybal said. “As soon as that first mortar round went off we’d triangulate their position and call in the helicopter gun-ships. Two of our gun-ships would be in the air in 60 seconds. One would come in from the right and the other from the left. If those gun-ships dropped on the NVA mortar team they were dead. “This happened every night I was in Vietnam. We learned very quickly when that first mortar came in to pancake onto the ground,” he said. “No matter how tired you were, whether you had been drinking or smoking or whatever, you pancaked onto the ground. That was our way of life over there. “There were times when those enemy mortars would come in our hooch and pepper it with shrapnel. All my clothes in my foot-locker were ripped up because it was hit by shrapnel. “One morning at 6 a.m. we had just lined up for revelry when an enemy mortar round came in. It probably hit 20-feet away from where we were,” Ruybal said. “We hit the ground and I was on the bottom of the pile. Seven of our guys were wounded. The most seriously injured were the guys who were taking showers. We were lucky nobody was killed. “After six months in Biên Hòa I realized we were never going to win this war. All the Vietnamese wanted was to raise their rice. It didn’t matter to them if their government was a democracy or a Communist-run government. They just wanted to raise their rice. “When we had time off a couple of us would catch a ride with a convoy going to Saigon,” he said. “I never liked going to Saigon because of the sniper attacks by Vietcong guerrillas. “Our whole division moved from Biên Hòa to Hue Phu Bai which was 30 miles from the Demilitarized Zone. It was the original capital of Vietnam and a beautiful city,” he said. “Once I transferred to Hue I never left the base. 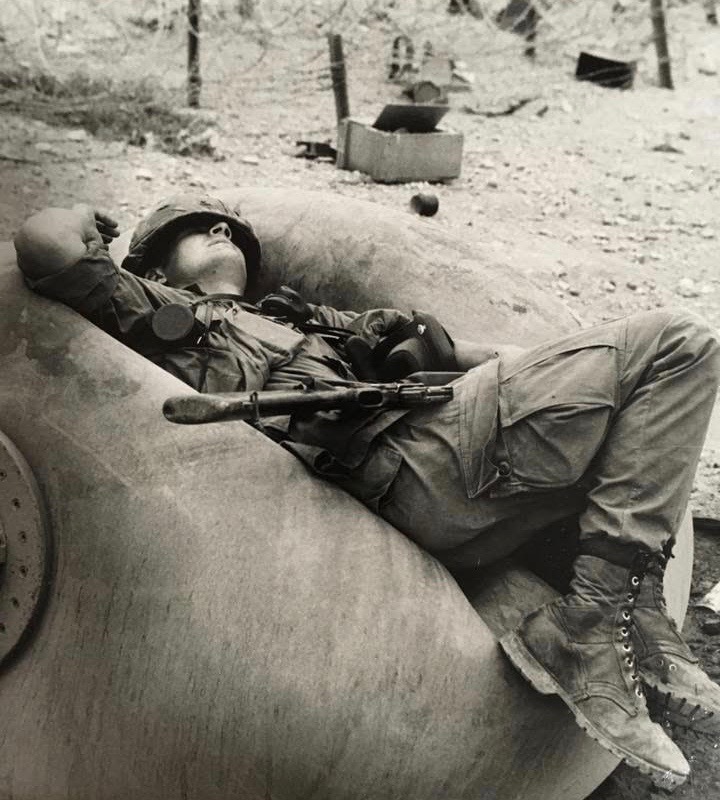 I was there for our ‘Hamburger Hill’ campaign. “General of the Army Westmorland told our general commanding the 101st to take this inconsequential hill held by the NVA that we eventually called ‘Hamburger Hill.’ We destroyed it and took it away from the NVA. “In doing so think we lost 70 killed and more than 400 of our guys were wounded. It was our job as typists in headquarters company to type all the KIA, MIA, and WIA letters home to the families,” Ruybal said. “It was horrible. We worked 24-hours a day for two weeks typing. “By this time I was in charge of the group doing the typing. They wanted to make me a sergeant, but I told them I wanted no part of being a sergeant because I would have to leave my guys. If I became a sergeant I would have to go live with the lifers. I didn’t want to live with the lifers, I wanted to stay with my guys. “The guys in my hooch were incredible. Problem was when you lived with somebody for year and they got wounded or killed something clicked in your head. You wanted to kill all the Vietnamese. “When my tour was over and I left Vietnam I was supposed to spend my last year in Germany. By then I had a girlfriend and I wanted to get back to her in California. So I rewrote my orders and sent some other guy to Germany and I went to San Francisco and the Presidio. “I remember leaving Vietnam. We flew out of Danang on a commercial jet. We were taking in-coming mortar fire,” he said. “Once we cleared the area and were out over the South China Sea everyone in that whole jet let out a roar. “We landed back in the States in Seattle, Wash. The biggest shock to me was going from a war zone 24 hours a day and flying back to the U.S. where thing were going on normally like nothing had ever happened and there was no war. 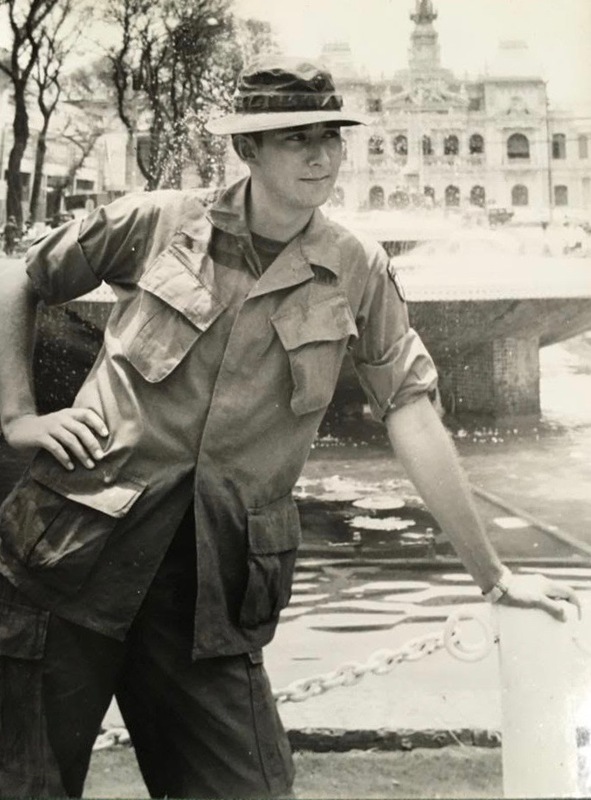 “While in Vietnam I received this letter from an 18-year-old young lady who lived in San Jose, Calif. She wrote me a letter that began, ‘Hi, my name is Karen. You don’t know me, but I’m the daughter of a friend of your aunt’s. And today that girl is sitting right here in my living room. “I had no idea who she was, but I wrote her right back. For the whole next year we wrote letters to each other. When I got home a beautiful young lady drove all the way from her home in San Jose to my home in Denver to see me. “I spent the next year working as a typist at the Presidio army base. There days before getting out of the service I had a weekend off. So we got married on a Saturday and I was back at base at work on Monday. On Tuesday I was busted out of the service. “I took the G.I. Bill and went back to the University of Colorado where I completed my last year of college. It took me four years because I had other commitments like a job and a wife. I thought I would be an English teacher, but when I found out how little they made I decided to go into sales. For the last 50 years I’ve been a salesman and enjoyed every minute of it. 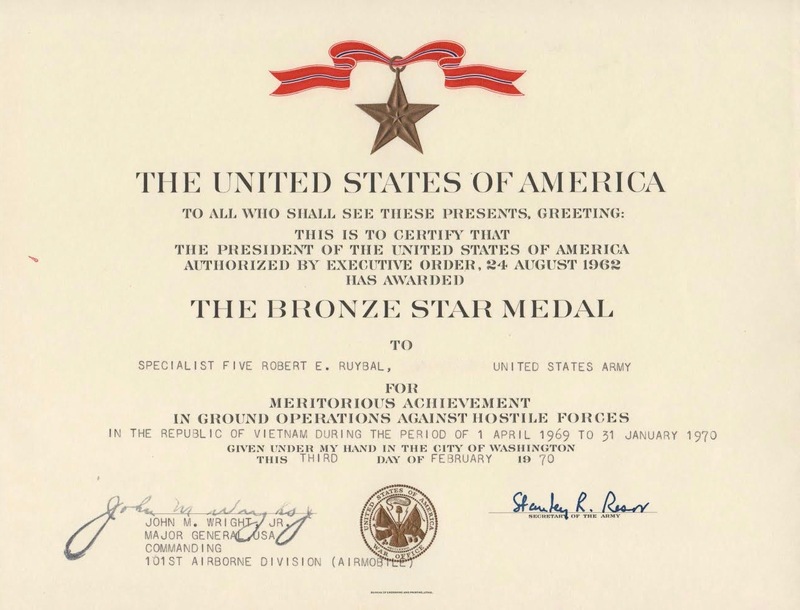 “During my 71 years I’ve received two letters that made a difference in my life. The first one was ‘Greetings’ from President Johnson when I went to war. The second one was from Karen, my wife, when she was 18 and I was a member of the 101st in Vietnam. The Ruybals have three daughters: Janna, Andrea, and Jordan. *Bob and Karen are planning a trip back to Vietnam sometime before the end of this year. War Tales will report on that trip when they get back. This story was first published in the Charlotte Sun newspaper, Port Charlotte, Fla. on Monday, Sept. 5, 2018 and is republished with permission. Click here to read part two of Ruybal’s with return visit to Vietnam. Thanks for your service. Glad you got the chance to re-visit Vietnam years after the war. Your company learned fast to sand bag your hooches, mess hall, and showers after the first Mortar rounds landed and tore up your wall lockers and clothing. I went over and saw clothing in lockers just on hangers in shreds. Yup I had issues because of the nightly attacks. I was at Long Binh before the Army Unit across the road from you. Glad you made it home. I’m from Wyoming.